Fiber Flux: Free Crochet Pattern...Yarn Scrap Basket for Birds! Free Crochet Pattern...Yarn Scrap Basket for Birds! Spring has sprung! Around these parts the flowers are showing the very first hints of color and the birds are back and singing their cheerful songs. 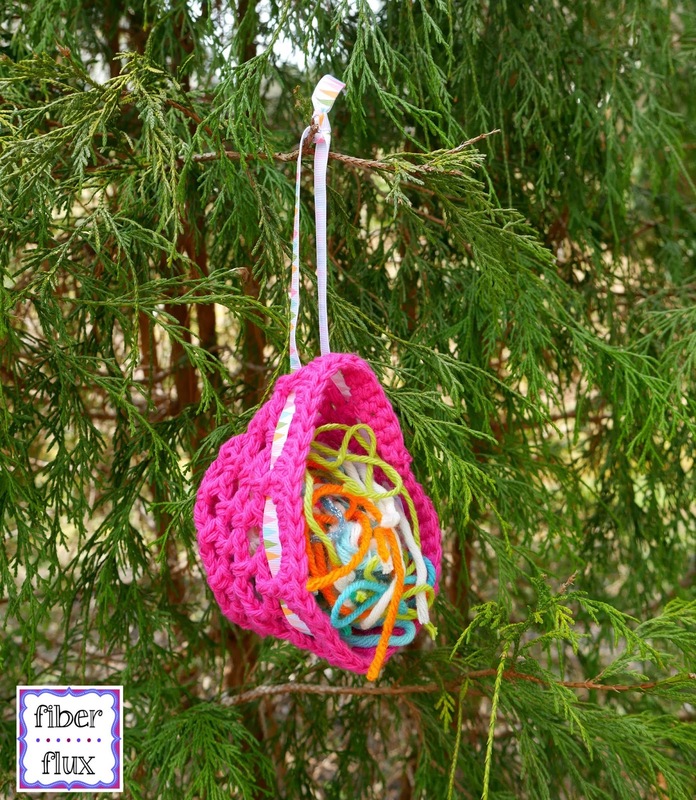 To help the birds build their nests, you can put some yarn leftovers out for them to take as needed. 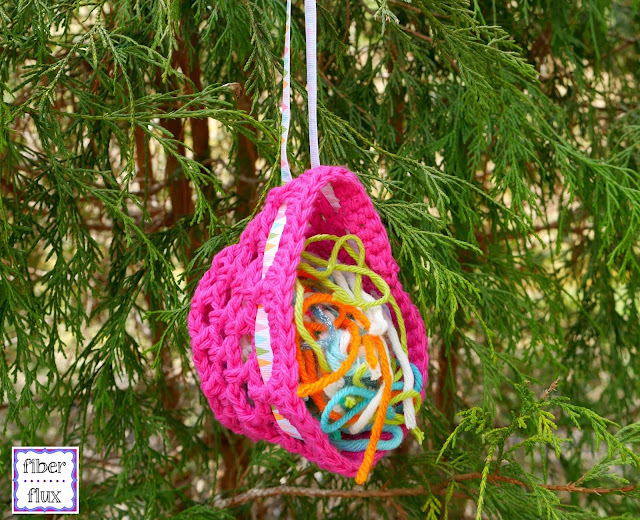 How wonderful it is to see colorful nests up in the trees made with bits of colorful yarn too! 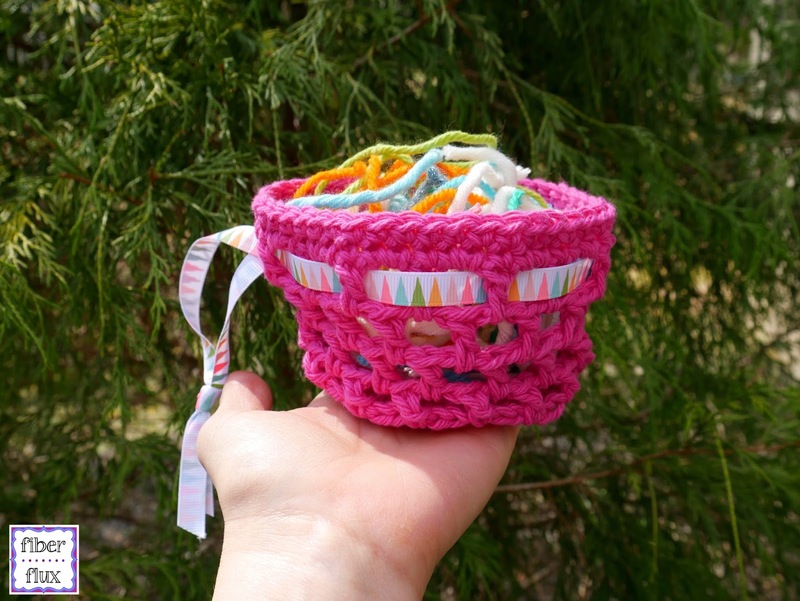 Best of all this can be made with any yarn you have on hand and a container you made yourself! If you want to help out your local birds even more, here are some more bird's nest materials and ideas from the Humane Society. **Important: Please be sure to use strands 2 inches or shorter to prevent the birds from becoming entangled or injured. Also, natural fibers are best. Cotton dishcloth yarn (yarn shown is Spinrite Sugar 'n Creme in "Hot Pink"
Ch 4 then join with a sl st in the furthest ch from the hook to create a ring. Round 1: ch 3, then work 11 dc in to center of the ring, join to close round with a sl st. Round 2: ch 3, work 1 dc in the first space, then 2 dc in each space around. Join to close rd with a sl st. Round 3: Repeat round 3, do not fasten off and continue to the next section. Ch 5, then *skip the first two spaces. In the next space, work a dc, ch 2. Repeat from * around the base of the basket. Continue in a spiral by working a *dc, ch 2 in each ch 2 space from the previous round. Work this spiral sequence until basket is 3 inches tall. Complete spiral by joining with a sl st into the next st you come to. Do not fasten off and continue to the next section. Round 1: ch 1, then work *2 sc in the space, then 1 sc in the st. Repeat from * around. Join with a sl st to close round. Round 2: ch 1, then work a sc in each st. Join to close round with a sl st and fasten off. Weave in any ends that remain. Using a scrap piece of yarn or ribbon, weave into the topmost "lattice" area of the basket as shown in the photos above. Tie a bow or knot to create a hanging loop. Fill with yarn/ribbon/fabric scraps and hang in a tree or shrub. Note: When filling the basket with yarn scraps, make sure the strands are not too long. If needed, clip them to be about 1-2 inches long. What happened to the video of this pattern? I viewed part of it when you released it and went back tonight to follow it and can't find it (though I see that some video has been deleted). What happened to the video? Will it be reposted?